The Transfiguration is such a complex event, that I always have random thoughts going through my head while I read it. Some are serious, some less so. Rather than try to weave them into one coherent post, I thought I'd just jot a few of them down in short form. Someone once pointed out to me the contrasts between this event and the Crucifixion. They are eery. Transfiguration: Jesus is up on a mountain, bathed in light, with His apostles around Him, and the voice of God praising Him. Crucifixion: Jesus is without clothes, nailed to a cross, with Peter and James nowhere to be found, two thiefs next to Him, and silence from God. We all lovingly smile at Peter's comment during this scene, but what often gets overlooked is that God cuts him off. Matthew tells us that "while he was still speaking" God speaks. 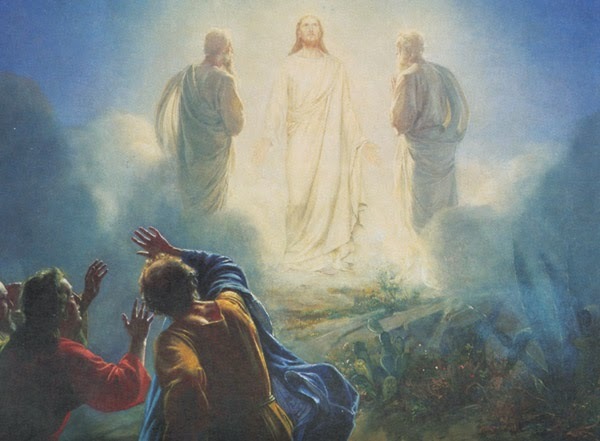 Scholars argue whether the Transfiguration occured on Mt. Tabor or Mt. Hernon. This might not matter to the casual reader, but to the apostles it would have. Mt. Tabor is 1,886 feet high, while Mt. Hernon is almost 5x higher at 9,232 feet high! Matthew does not mention this, but Luke does - the apostles were sleeping during part of this, and awoke to see the splendor. It is a lovely thought with much symbolism ... the beauty we can see when God awakens us. Jesus asks Peter, James and John not to say anything to anyone until after He is risen. How hard must that have been for them! I hope you are all having a Blessed Lent! I too have many thoughts about this passage. But to answer your first point. Peter and the others knew Moses and Elijah from their photos on Facebook. What I don't understand was Peter's suggestion to build three tents. How would he do that? Did he have the tents with him? Or would he go down the mountain to the outdoor pursuits camping shop and buy the tents? I agree with the contrast with the Crucifiction. Also note the contrast with Christ's baptism when God spoke similar words there too. Have a Blessed Lent Michael. Great post. I love all those points you made. Gives me food for thought. God bless!